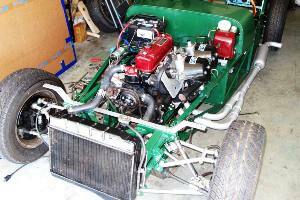 We spent most of the weekend bolting on the rest of the engine parts. As the sun started to fade on Sunday evening we hooked up all the wires to the starter motor, including the positive battery cable, and thinking that might be enough to spin the engine we plugged in the key and gave it a twist. Nothing. 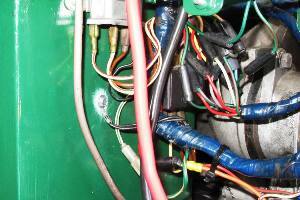 Not a click or a spark or even smoke from a short circuit under the dash. So we called it a day. That evening it occurred to us that we might've had more luck with the starter if we'd plugged in the wires to the ignition switch. It also occurred to us that it was probably best that we didn't plug in the wires to the ignition switch, because a) the engine didn't have any oil in it, and b) Any residual oil that was still in the engine would've squirted out the open fitting for the oil pressure gauge, which we hadn't hooked up yet. So we spent the next morning hooking up the oil pressure gauge, including cleaning and re-bending the copper wire that runs from the engine bay under the dash to the gauge. We also bolted on the exhaust, fitted all the seals around the pedal box, filled the engine with Mobil One 10-40, and filled the transmission with Redline MTL. 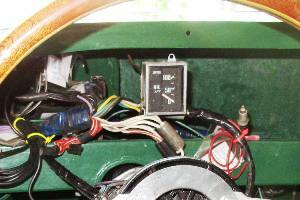 We then plugged in all the wires to the ignition switch, and with expectations suitably high we turned the key. Nothing. But this time the alternator light came on. So we had power. What we didn't have was power to the starter. And since the starter runs directly off the giant battery cable, what we actually didn't have was power to the starter relay. So we spent the next two hours painstakingly checking and rechecking the connectivity of each of the wires plugged into the starter relay, except of course for the ground wire which is never the problem, except in those rare instances when you're installing a harness in a new car for the first time and you haven't connected all your harness grounds to the chassis. So two hours later we wrapped a bare wire around one of the screws sticking out of one of the many tab in our engine bay. 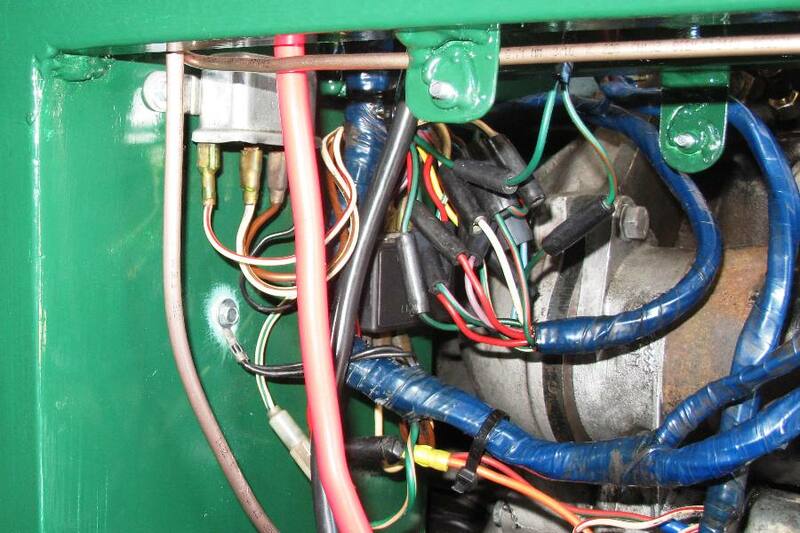 We then attached the other end of the wire to the ground terminal on the starter relay, turned the ignition key, and the engine jumped into action. That was definitely exciting, but we were a little nervous after a few seconds when the oil pressure gauge still read zero. No oil pressure would be bad. We popped the oil cap off the valve cover to look inside, and the rocker arms were dry. That would be bad, too. So naturally the only thing left to do was to keep spinning the engine until a) the battery died, or b) the bearings froze. As it happens, after another five or ten seconds we got option c), the oil pressure gauge came to life, and also option d), the usual oil seepage out of the thick cork valve cover gasket which tells us that our British engine is working properly. In the M.G. world, that counts as a total unqualified success. We're this close now to getting the engine started. 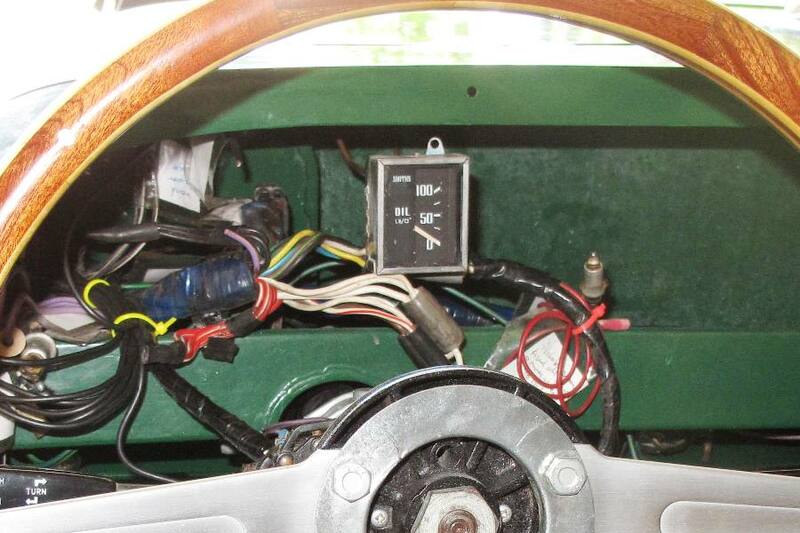 We just need to get the ignition working, which according to our MGB wiring diagram involves installing the tachometer, and then figure out a way to get fuel to the carbs. We also need a way to operate the choke and the throttle. We saved the choke cable from the donor, and it's a little crusty but we could probably install it, although that would mean drilling even more holes in the dashboard and firewall. Alternately, we could operate the choke from the engine bay. We may also have to operate the throttle from the engine bay. We bought a brand new MGB throttle cable from Moss Motors and it would've been super easy to hook it up to the gas pedal if it weren't for the fact that a stock MGB throttle cable doesn't fit in a Locost. It's about 3" too short, or actually just half an inch too short if you don't mind right-angle bends in your control cables. But either way it's not going to fit, so we ordered a new throttle cable from Jegs, and it's just 3" longer than the MGB cable so we'd better be pretty close with our estimate. 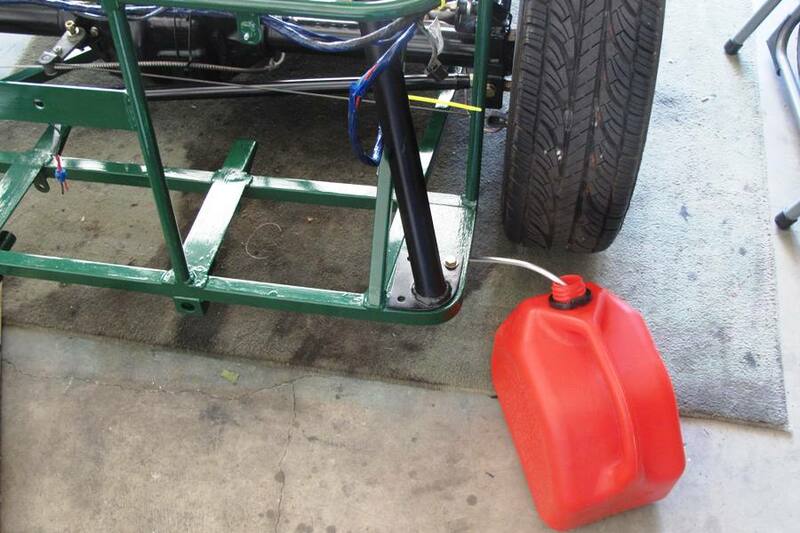 The last obstacle is going to be getting fuel to the carburetors. 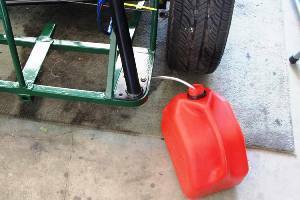 This would be simple if we had a working fuel pump, which we do, and all of the banjo fittings needed to attach the fuel lines, which we don't. Every other part that we could possibly need to get the car running was sitting there on our parts shelves, right down to the distributor cap and the fan belt. But not the banjo fittings. I don't understand why it's so hard to keep track of these parts. We had the exact same parts go missing a year ago when we tried to get the donor started. So we ordered the banjo fittings from Moss, but according to the latest info we have from the U.S. Postal Service, the parts are still in Goleta, and probably won't get here before Friday. Meanwhile we're contemplating setting up our old gravity-feed fuel arrangement, just to see if the car will start, although we'd like to avoid that if at all possible so we'll see if we can keep busy working on other stuff for the next two days.